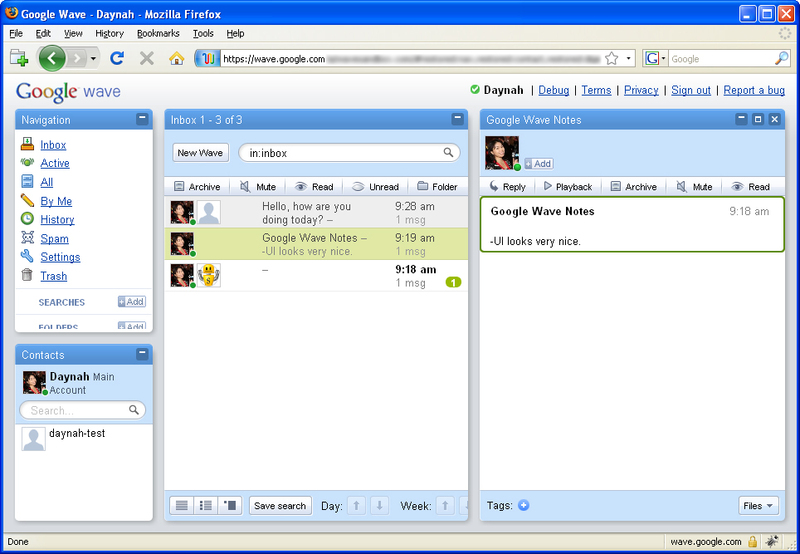 Wow, Whirled uses Google Wave to say goodbye to 2009. This is incredibly ingenious! Thanks for tweeting about it Robert! December is finally here. Happy Holidays! I thought I’d start off the month by giving away a few more Google Wave invites! I’ve been giving them away on a first comment, first serve basis, so I thought I’d change it up this time around. If you would like a Google Wave invite, please answer the questions below. I will send invites to the most creative answers! Hint: longer answers help! The reason why I do this is 1) I don’t want to give accounts to spammers and 2) I like to get to know my readers and 3) because it’s fun! How are you going to spend your holiday season? What is your favorite book, movie, or song? What is your favorite internet web show? What is your social media tool(s) of choice? What is one thing you know about me? What would you like to know more about me? Good luck! I will start sending out the invites this weekend, and continue to while supplies last! Update: 11/13/2009, 10am PST – I’m so sorry, but I am out of Google invites at this time. When I get a new batch of invites, I will announce it on Twitter. Please follow @daynah for updates. Thank you for understanding. What are your favorite mobile games (games for iPhone, DS Lite, other smartphones, etc.)? What’s something you know about me? What would you use Google Wave for? For more tech news, giveaways, and updates, please follow my Twitter account @daynah. Google Wave ya later! Note: Google Wave accounts are not activated right away. Activation may take up to a few days. Tekzilla explains what Google Wave is. Thanks so much for the shoutout Veronica! You can jump to the segment at 3:43 or go to the Google Wave segment notes. 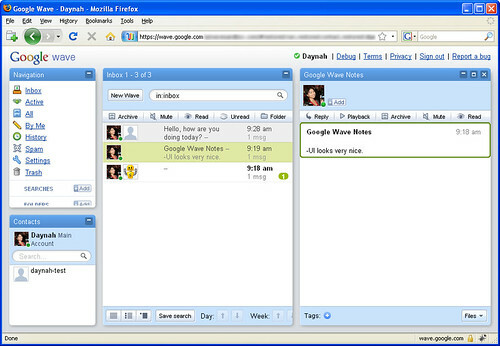 This is my first look at Google Wave. My account was activated today, and I’m quite thrilled to try it out. I’ll post more as figure out things. For now, this is my first screenshot. First impression, it looks like an email client, but it’s not. I wanted to change my profile photo, so I clicked on the blank square in the “Contacts” section and it gave me a link to change my photo. This link takes me to my sandbox gmail settings. After more clicking, it takes me to my sandbox Gmail account. It looks like email isn’t integrated into Google Wave interface (yet?) besides having the two accounts linked up.